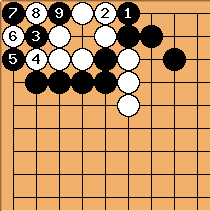 In the page on the one-space low pincer, it is mentioned that this corner is ko if Black plays first. There are two ways to start this ko, but one is clearly better than the other. The 'wrong' way to start a ko is by this sequence. If Black wins the ko in the conrer, White dies. If White wins it, she lives. In this diagram, if Black wins the ko, he can take the stones off the board. 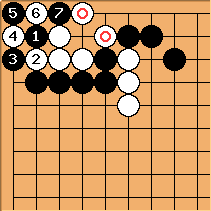 This means that White has no aji left whatsoever. In the other diagram, a small amount is still left. 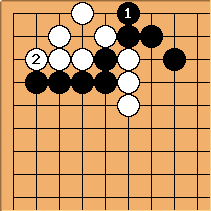 In this diagram, White has to make the first ko threat, whereas in the other diagram, Black does. Anonymous: Why not skip in the second ko, playing directly ? 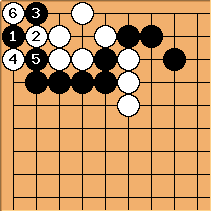 Chaz: Skipping gives white more aji because black winning the ko doesn't capture the marked stones (see Reason 1 in why second ko is better). Thus the exchange of , is considered the proper way to start the ko.